I think if we were living resourcefully, we would make the most of what we had around us, in a way that meant that we came together as communities, to share resources, and that we took responsibility for what happens within the life of the resources that we use, as individuals, and as families and communities. Recycling, reusing, reducing, remodeling, and reselling! Juliet Arnott’s social enterprise ‘Rekindle’ is all about diverting reusable resources from waste via creativity and craftsmanship. Juliet Arnott studied at Otago Polytechnic’s School of Occupational Therapy and went on to use her creativity and craftsmanship with community groups, schools, health groups, artists and designers. Rekindle originally focused on diverting timber from waste within residential demolition in Christchurch, turning it into furniture, interiors, sculpture and jewellery. One of Juliet’s more famous projects was Whole House Reuse, where her team deconstructed and transformed an entire earthquake damaged house into beautiful and purposeful artefacts. More than 250 people from around New Zealand and the world were involved, creating everything from a delicately carved taonga puoro to a finely crafted backyard studio. Juliet will be honoured in May as one of Otago Polytechnic’s distinguished alumni. Samuel Mann: Welcome to Sustainable Lens Resilience: On Radio, a weekly show on sustainability topics brought to you by Otago Polytechnic. The show is co-hosted by Shane Gallagher and me, Samuel Mann. Each week, we talk with someone making a positive difference and applying their skills to a sustainable future. In our conversations, we try to find out what motivates them and what it means to see the world through a sustainable perspective, through their sustainable lens. Tonight’s sustainable lens is that of Juliet Arnott, the artist, a founder of Rekindle, and an occupational therapist. You trained at Otago Polytech. Juliet Arnott: That’s right. Yeah. Samuel Mann: Thank you very much for joining me. Juliet Arnott: Pleasure. It’s lovely to be here. Samuel Mann: Let’s start with questions about you. Where did you grow up? Samuel Mann: Did you say Canvastown? Juliet Arnott: Which was a gold rush. Yes. It had this wonderful history. In fact, we spent a fair bit of time in our childhood with our gold pans in the river, ever hopeful. It was a pretty lovely existence, living off the land and living pretty closely with the resources around us, I suppose. Samuel Mann: What did you want to be when you grew up? Juliet Arnott: That’s a good question. I don’t know that I really had a clear sense of that. I just remember being encouraged by mum, particularly, towards being creative. But no, generally I don’t recall what I was particularly aiming at. Samuel Mann: What did you get involved in? Juliet Arnott: It was a pretty rural community, so it was barefoot running around. I just remember being outside, I remember being on the farm, involved in all the usual farming activities, and really enjoying that. I do have this story that I recall, which relates to how things did develop in my life, which was Mum and Dad had this beautiful rush basket, that acted as our bread basket. I remember quite clearly, this experience. I must have been really quite young, maybe five or six, going out down to the paddock below the house, which was full of rushes, a different kind of rush, and attempting to weave a basket, but I was completely inept. I absolutely didn’t have the understanding of how to do it, but I remember the magic of that basket as an object, and that’s kind of lingered with me, I think. It’s definitely part of what has since rolled out in my life, I suppose, as that journey towards understanding how those simple resources can be harnessed and valued. Samuel Mann: I won’t make the obvious connection between baskets and occupational therapy, but is that what got you into occupational therapy? Juliet Arnott: It was! My mother was a nurse, and I think in my teenage years, when I was starting to think about what I wanted to be, she did encourage me, or my parents encouraged me towards a health profession. I remember one day, bizarrely, we were taken on a tour of the local … In Nelson, where I was at school, taken on a tour of the local … What was then a psychiatric institution, called Ngawhatu. It was really the old fashioned style of institution, and we were walked through it, which I look back and think how bizarre that really was for school students. I saw this woman working in the industrial woodwork shop, and I saw her role and thought what an incredible role to have, to be able to work creatively with people, to work practically in that way, I suppose. That was all I really knew of occupational therapy, in some regards. It was only when I showed up at Otago Polytech and got onto the course in 1993, that I realised that actually, I had hit the jackpot and I actually had found something that was really aligned with what I valued and was really intrigued by, I think, by its diversity and the fact that it connects with what we do every day. Samuel Mann: Did it deliver what you were hoping? Juliet Arnott: Yes it did, and it didn’t. It did in the sense that I learnt a lot. I learnt a huge amount through my training, and through the first probably, fifteen years of my practise, where I was attempting to … Where I was learning about the health system and how it functions, and then attempting to find my place within it. In terms of being able to work well, and truly therapeutically within that system. I think I continuously hit up against the struggles of that system, and whether it was the lack of funding around the time that I could spend with people, or the way that services were limited in the way that they could genuinely support people through big change and challenge in their life. It was helpful in learning some realities, but it’s also been frustrating, I suppose, to be exposed to some of the current systemic challenges. But then, it’s pushed me on to look at something beyond that more conventional occupational therapy role. Samuel Mann: Because you wanted to do more than was in those bounds, or …? Juliet Arnott: Yeah. One of the common struggles for me, and I think definitely for other occupational therapists, is that you end up working within the health system, and you work with the people who have needed your support for the time that the service allows them to be a part of that service, but then you have to support that person back into their home, or back into their daily existence outside of the service. And often, there’s not enough there. I’m particularly thinking in terms of mental health services. There’s simply not enough there, to aid that person, to bridge that gap between being really quite unwell and being quite dependent on a service, through to living a really healthy, productive existence, engaged in community. That gap really was something that’s difficult to do anything about, from inside the service. I guess what has happened gradually over the last few years, has been that I have been attempting to create some of these opportunities that I would like for people going through those challenges to have the opportunity to experience. I guess part of the journey recently has been about trying to evolve, and what I was frustrated with the lack of in the past. Samuel Mann: What was your first venture outside of the conventional bounds? Juliet Arnott: In part, it was probably … For quite some years, I worked conventionally as an occupational therapist, but on the side I would continue my own creative practise, and the two co-existed. I would go to work and talk about doing my basket weaving, and my colleagues would laugh at me, and I would try and explain to them how important it actually was. I had these two very separate parts of my life, and the creative practise was very much, that was when I was living in the UK, and it was very much about my own personal connection with the environment that I was living in, but it was also about revealing the value of materials that were being wasted in the community around me. That became a bigger and bigger part of my life outside of occupational therapy, to the point where I was being commissioned to make work, sculpturally, with these waste materials, and would do that half the time, then in the winter when I wasn’t doing it, I would work as an occupational therapist. It’s been a gradual journey to the point where returning to New Zealand, that’s when I started Rekindle and the two came together more indefinitely. Samuel Mann: What prompted the interest in waste materials? Juliet Arnott: I think the reality was, growing up in that fairly idyllic farming situation, you’re exposed to a fairly simple relationship to the resources around you and understanding where the natural limits lie, and how to live well with what you have around you. Then, I was quite struck, in a fairly naïve way, when I did move to the UK in my mid twenties, and even in rural England, was surprised that there was quite a strong culture of consumption and disposal. It was that really, that pushed me to really look around in my day to day existence, and to really want to make something of the material resources that I was seeing around me that were going to waste. That particularly started with things like the prunings from the hedge rose when they were trimmed. Corpus material that was cut from Willow or Hazel trees. Then, that moved on through and to … As I learnt crafts to use those materials, then through to use of a lot of the waste that washes up on the beaches in the UK, a lot of rope and plastics. It evolved as my wanting, needing, to make sense really, of what I was seeing around me, in some sort of vain attempt I suppose, to show the value of what that stuff was, because mostly, it was being ignored. Samuel Mann: And you came back here? Juliet Arnott: I came back in 2009, after 9 years away, and was feeling relatively displaced, and didn’t really have a grand plan for my return home, and found myself in Auckland for the first time, which I enjoyed. But again, I realise now I was quite naively struck by the waste that I found there. I think that I had imagined that in New Zealand we were well beyond things like landfills, but I obviously found we weren’t, and was just surprised at the dependence on the land fill mechanism and at that time. A lot has changed since, but at that time was surprised to find a big pile of wood out at one of the transfer stations in Auckland, and that is what I responded to with the initial furniture designs that I came up with for Rekindle. Samuel Mann: You established Rekindle…so Rekindle 101…? Juliet Arnott: Rekindle 101, yes, it’s definitely been a big journey since then. Rekindle 101, in a sense … I was living in Grey Lynn in Auckland at the time and I was appreciating all the beautiful old villas around in that area, and other suburbs of Auckland, and realising that there was a fairly common sight to see skips with a fair amount of timbers in them, whether renovations were happening, or to see demolitions underway, and I guess that combined with the wood pile I had seen in the transfer station, I was very intrigued to understand what this was all about, and then to learn that of course, demolition and construction waste are such big contributors to our land filling here. I decided to try and come up with a furniture design that would just reveal some of the structural integrity of that material, some of its beautiful aesthetic value and obviously its cultural value, in terms of it being ancient indigenous timber. I did that with the help of a couple of furniture makers in Auckland, we worked together to prototype the first chair, and then tables, stools and the like. I had just started putting those out into the world, and made a first couple of sales up in Auckland, and then started … I guess being aware through my previous relationship with Christchurch, that my old home that I had lived in in my early twenties was now facing of course, this mess of challenge with regards to demolition waste and the dis empowerment that was occurring as part of that hasty process. That was when I started to think about coming back here, and what role I could play really, in that period of demolition. Samuel Mann: Your website makes the connection between not just the waste, but the community? Samuel Mann: And you just talked about that sort of, in the dis empowerment and the waste. Tell me how you’re bringing those two things together. Juliet Arnott: I suppose I find it hard to look at waste without wondering how making waste affects us as humans. I think it’s something that we take for granted that we do, which of course, naturally, many of the inhabitants of this earth make waste. I don’t think we think enough about the impact of that. I think when your ability to hold on to something that you value, is taken away from you, and when the resources that you have owned are taken away from you, and their disposal is managed by someone else, that … In terms of how the demolition played out here, was very difficult for a lot of people. When people are choosing to dispose of their own resources, that’s a whole other story, but I think for people to have that choice taken away from them, was very difficult. Both taken away by the earthquakes themselves and by the damage that occurred, and of course, by the bureaucratic processes that would naturally unfold afterwards. I think for me, as an occupational therapist, I see both naturally the environmental concern about the waste, but for me it’s much more than that, it’s the human experience of disposing of materials that we still see as having value. There’s something futile about that, there’s something even a little hopeless about not being able to take the time to value the things that we would perhaps even feel a bit guilty about throwing out ourselves, if we had done it ourselves. It relates to our need to demonstrate value, when that exists. I think if we’re not experiencing that, if we’re not given the opportunity to experience that, that becomes quite problematic. Samuel Mann: Are we not quite happy having somebody take it away? Samuel Mann: We put the bin out at the curb and it disappears. Juliet Arnott: Absolutely. We would say that we probably would, in most cases, not value the material that we’re putting in those bins, versus say the residential demolition. Different thing. I think … It’s such a complex thing, but you know there’s that thing about there’s hidden nature being useful at times, when we don’t have to face the land fill. If the land fill was just over there, and we saw the seagulls, we might feel slightly uncomfortable, versus what we were seeing with the residential process that was that obvious to us, it was in our faces and that was incredibly difficult to witness. Samuel Mann: You arrived back in Christchurch, thousands of houses being knocked down. Samuel Mann: Where do you start? Juliet Arnott: It was quite overwhelming. I didn’t really know what the solution was at that time. It was a very difficult bureaucratic process to even understand, let alone intercept. I spent probably a year speaking with demolition contractors, gaining their trust, getting them to understand that what I wanted to do wasn’t crazy, it wasn’t unsafe, that I wouldn’t slow them down. Initially, we did a lot of salvage just on sites where the diggers had been, and they’d just left a pile of crushed timbers and we would haul out what was still viable for furniture. But, over that first year, we worked out a way that worked, and with the contractors so that we would salvage before the diggers arrive. That’s how we got rolling really. It was only a symbolic thing in the sense that we were definitely not [occurring] … We were definitely not able to grow this capacity to salvage timber, to the degree that we could really address the whole problem, but I guess we just did our best within the constraints at play. The second big response I had to the scale of it all, was the Whole House Reuse project, that very much acknowledged the fact that there were at least 9,000 homes in the red zone, and more, demolished beyond that. How on earth do you attempt to make a statement or celebrate the homes that were lost, or even define the value of a home. It was really hard to know how to even begin to think about these issues. I decided that perhaps if we just put all of our energies into this, to the ultimately resourceful response, to just one home, that we might see something from that that feels heartening for us, so that’s what we did. It didn’t happen for the first … We worked on it for years, but didn’t really get underway until Kate McIntyre came on board as the project manager and we managed to get a red zone home from a demolition contractor, and all of the funds raised to allow us to fully deconstruct that home. We then published a book with a catalogue with all the materials from the home. We used that book launch around the country to call for creatives to submit designs of the materials from that home. That lead to those successful designs being then issued. The people that submitted those were then issued the materials. We sent the materials all around the country and across the world, in fact. And then, the successful objects were sent back. We’ve received around 400 objects made from the home that were later exhibited in Canterbury Museum in 2015. Samuel Mann: So, nice and slowly…you took it apart? Samuel Mann: Piece by piece? Samuel Mann: Laid it all out somewhere? Juliet Arnott: Literally, Kate and a team of volunteers put it on trailer loads and took it to the storage unit, categorised it, photographed it, measured it, and created this taxonomy of what we think is the first time in the world that a whole house has been classified in that way. We utilised that catalogue to call for designs, then we had designs submitted from all over New Zealand and some from overseas, from people, from professional designers and makers through to hobbyists and school children, and really fantastic craftspeople, legends of their time, like Brian Flintoff who is New Zealand’s, one of the most remarkable carvers of taonga puoro. With things like an amazing artist on the Isle of Tiree in Scotland, we sent her some broken window panes and she sent back some beautiful slumped glass vessels. Some really wonderful creative responses that valued the material. Samuel Mann: Did people put in a bid, and say ‘I want two taps and a cupboard door’? Juliet Arnott: Yes. They all had to kind of … They all had the same catalogue so it was quite a logistical process, making sure that different people didn’t want the same stuff and all of that, and getting it out to people and then getting the finished objects back. But, generally, Kate managed that process and generally it seemed to work quite well. Samuel Mann: What was the most sought after bit? Juliet Arnott: Do you know what, I don’t know. I think the timbers … The obvious things, like the beautiful rimu and things were pretty popular, but that actually worked out, that was actually quite well spread. That was kind of … We also did it in a couple of rounds, so it wasn’t all at once. We had the first wave of designs, then we had the second wave, it was helpful to co-ordinate it in that way. Yeah. Then, the variety of things that people made were just extraordinary. Samuel Mann: What sort of things did you get back? Juliet Arnott: I mentioned Brian’s taonga puoro, he made some beautiful floats and wind instruments, traditionally carved with [inaudible 00:21:30]. He carved these most beautiful boxes that were traditionally made to store the huia feathers, so they were just three really beautiful ornamentally carved, boxes. And we had Tim McGurk who made a whole lot of stuff with his partner Emma Burn. He made a double bass, which was called the Double Basin, which had a basin as the resonator for the instrument, and it was playable. We had David Trubridge make a magazine rack/coffee table. We had Nic Moon and Lynn Russell from Nelson make the largest object, which was this really beautiful studio building, and it was built in Nic’s –Nic’s an artist in Nelson, it was built in Nic’s garden, built for deconstruction, so that it could be deconstructed to be brought down here to be reconstructed in the museum. That was pretty amazing, and very beautifully furnished. She worked on it very laboriously and the whole finish was very painstaking and beautiful. There are some beautiful images of it on the website, actually. Juliet Arnott: What, the outcome? Juliet Arnott: We’re actually just in the middle of finalising an academic article on this, because we have. What happened at the end of the exhibition was that the makers could decide what happened to the objects. Half of them chose to put the objects forward into a charitable auction, so we literally have a monetary value associated with those objects, as to what they sold for. Some of the makers also chose to gift their objects to the home owners, which was really wonderful, then the rest … Most of the rest either they went back to the makers, because the makers weren’t paid anything, they did this out of their own goodwill, so they could take their objects back or they could gift them into the community, if they had a specific community purpose in Christchurch. We are doing sums around the value, the monetary value, we’re also doing some sums around essentially what was diverted and how much of an impact that would essentially have. That’s quite useful information to reflect on, the rest of what happened here in Christchurch. Samuel Mann: Did you get stuck with anything at the end? Juliet Arnott: Yeah. We really wanted to reuse the whole house. The shame of it all was, we actually ran out of time. We would’ve been able to. We could’ve kept pushing it, but actually we had to commit to the exhibition and we literally ran out of time, so we were left with a couple of toilet bowls. We still had some weird things like corrugated iron. Weird things like buckets of nails, because the other quite interesting thing was that, when the makers received the materials, their waste from their making processes, we asked them to send that back, so we actually received buckets of nails from the de-nailed timber. Things like that had a ready place on the scrap metal market, for example. If nothing else. In the end … I’m trying to think what was really hard to deal with. There were things like the boreded timber, for example. The idea with that was that … We weren’t allowed to go to the Canterbury Museum funnily enough, so that stayed in the paddock. Things like that can become wood chip, depending on it’s use. We did really well. I can’t remember the number of items we had left, but there was a chunk, but not too many given the scale, I think. Samuel Mann: Did the house have visible history? Layers of wallpaper, and things? Juliet Arnott: Yeah, there was some cool things like that. There was things like … And actually, some of the photographs, before we deconstructed the home, we had an amazing photographer, Guy Frederick, come and document the home. There’s things like, there’s this beautiful cupboard in the laundry bathroom area, you opened the cupboard up and inside there was this bright orange patterned wallpaper from the 70’s. There’s definite areas in the home where you could see the patina of life in there. We spent time before we deconstructed it, with the family and we invited in some of the older families that had lived in the home before the current homeowners, so we really traced as much of that history as we could and documented that, and we showed that in the exhibition with photographs and the like. We really wanted to celebrate the life that that home had held. Samuel Mann: Is this story ongoing? Juliet Arnott: Well, it’s paused at the moment. The next part we would really like to raise funds for, is to document where all of these objects have ended up and end in their current use. One of the key criteria that we had in the design brief is that the objects needed to have utility, so we would love to be able to follow the story of the objects and see the full life of the house and its new use. Otherwise, we have looked at, with enviro schools, at creating an educational resource from it also, so hopefully we’ll get to do that at some point. But, that’s probably acting otherwise, but its legacy in the sense that we learnt a lot in that is certainly spilling out into my work now in Kokoda, for example. It was certainly a journey. We were quite pleased to get to the end of the exhibition, just because it literally, physically, it was an enormous process to manage. Samuel Mann: You worked with the museum to do the communication, the narrative around it? Juliet Arnott: Yes, and to show the work there. There’s actually a lovely film online, on the Whole House Reuse website, that depicts the whole story and gives you some sense of what was seen the in museum. Samuel Mann: Would you do it again? Juliet Arnott: Well, it’s funny you ask that. I’ve been asked that several times, in some cases it was a genuine wish to do it again, and I don’t think I would. I think I would do parts of it again. I think there’s ways that it could be done to make it easier. I think there’s ways that it could be done to make it have greater impact, too. I think it’s a wonderful way for a community to come together around something that they’re feeling concerned about. Samuel Mann: You talked about how building the community in terms of volunteers. Are enterprises springing up out of this sort of work? Juliet Arnott: Yeah, I think to a degree. I think there’s various things that happened here, in Christchurch. We certainly saw a boom in the demolition industry and the salvage industry. I don’t know in terms of creative entrepreneurs. I wouldn’t say there’s been that much. My sense about that in Christchurch is that there’s been a lot of things that people have been dealing with. I think when you look at waste minimization across New Zealand though, we are seeing more and more of a thoughtful, creative response to waste, as a means of raising its value, so to divert it from land fill, and it’s really lovely to see that, I think. You know, certainly see that, and the work of the community recycling network across the country, and the awesome organisations like Extreme Zero Waste in Raglan, and Wanaka Wastebusters, and those organisations. They’ve been doing that for some time. Samuel Mann: You talked before about a resourceful response. What’s your take on resourceful? Juliet Arnott: That’s become a really big focus for me, I think. When I finished the Whole House Reuse project, when we packed that up and had taken a bit of a holiday, I realised that I didn’t have the energy left to keep working with the focus of wastefulness. It was too … The machine, the big waste making machine, whatever it might be, and whatever is contributing to that, is so vast and there’s so much of it, that for me intellectually, it was becoming a struggle to see how to keep working with that positively. I did a lot of thinking about what’s the other, what’s the antithesis of wastefulness, and really out of that thought came this notion of resourcefulness. That, if we were to look at our lives in that healthy state, and that opposite state to wastefulness, it would be a resourceful way of life. It would be a way of living that allows us to be very much in touch with the resources around us, with the natural limits of those resources. I think if we were living resourcefully, we would make the most of what we had around us, in a way that meant that we came together as communities, to share resources, and that we took responsibility for what happens within the life of the resources that we use, as individuals, and as families and communities. I think, for me, more and more I’m focused in terms of developing that concept of resourcefulness, what it looks like, what are the realities of that, what do we do, how do we build that positive relationship with the material resources around us. I think you can’t help but reflect on that, by reflecting on your inner resources as well. You can’t just think about … You can’t separate out really, our relationship with what’s around us, without considering how that makes us feel. I can’t, anyway, I should say. Resourcefulness for me, reflects both that positive state, in terms of our [inaudible 00:32:46] and consideration of the earth and the resources that we utilise from it, but also how that impacts on us. If we act resourcefully and repair a piece of furniture, or an appliance that breaks, then that changes the way we feel. We feel it builds our sense of the resources we have to cope, to feel confident, we have what it takes to manage when we don’t have much money, but we have something break on us. It builds our confidence that we have hands that do the things that we need them to do, or that we know about materials, we know about wood, or textiles, you know. That intimacy between us as humans and the resources that we live around constantly, and interact with, is something that is so present that sometimes we don’t really … We almost don’t think about it. Samuel Mann: Do you feel as though you are fighting a machine? Juliet Arnott: I feel less like it now. The work that I’m doing currently with Rekindle, is very much focused on the resourcefulness, on depicting and bringing out experiences of that. Offering people opportunities, to feel resourceful, as well as still doing some work that is directly addressing wastefulness. It’s not that I’ve given up on that, it’s just that the two for me need to … I need to show them both, as parts of a continuum or spectrum, for me to feel that we’re really focusing on what’s positive and possible in all of this. Samuel Mann: What does a resourceful world look like? Juliet Arnott: I think it’s one where we are just fundamentally really aware of our relationship with what’s around us, so therefore we don’t discard of materials before they’ve had a full life. We also don’t chose to use materials that area harmful to their origin, or to the earth or to each other. There’s all of that knowledge about where things come from, where materials have come from, how we use them in relation to how that impacts the environment, and then also how we share those resources. Because, how we share those resources, how they flow within our communities, also relates to our access to resources, and in terms of poverty and the like, I think there’s a huge amount to be gained from living resourcefully in communities, in terms of improving our access to resources. Samuel Mann: Have we lost the ability to do that, though? Juliet Arnott: I think it’s definitely compromised, currently. I think our consumption and a lot of autonomy in our daily lives around … Not so much autonomy, but anonymity, I mean. Each household tends to do whatever they do, with waste. They’re not obviously accountable for anyone else, or anything. There’s not a lot of shared problem solving around that, there’s not a lot of shared responsibility around how we care for the resources that we have. I know for efficiencies sake, it’s good that we have great waste minimization organisations helping streamline that, but the bottom line is that it takes away our sense of need to deal with these things. In some ways, I think that’s problematic. Samuel Mann: Do you have any idea how much of the, whether you want to see it as a positive or a negative, but, how much of our individual contribution to the waste we actually have control of? How much of it is upstream or downstream of us, and we don’t actually have much control over? Juliet Arnott: I think we do. I think nowadays we have significant opportunities to control it. For example, the use of the second-hand market has been demonstrated to be a really considerable opportunity to divert material from land fill. I guess, effectively, simply that choice of buying new or buying second hand, that can really impact what ends up going to land fill. It’s not all about the designers or who’s creating what we find on the supermarket shelves. Yes, that certainly contributes to things, and packaging and all of that is problematic, but we absolutely have the choices. Many of the choices that we need around us, in terms of avoidance of packaging, and buying locally without packaging at all, and shopping second hand. That kind of thing. Samuel Mann: One of the things that we like to talk about is how a sustainable future is a better future, not a lesser future. I think well framing that, in terms of this positive relationship. But, to what extent are you and I, and a disappointingly small band of others, kidding ourselves? Juliet Arnott: The occupational therapist in me, looks at mental health statistics, for example. I can’t help but look at that and think, that is such a massive sign that we as a race are really, really struggling with our current way of doing things, and that our search for meaning if you like, in itself, is really challenged by the current way that we do life. I think things are becoming so dire, both in terms of our mental health, but also in terms of the economic struggles that we’re seeing around the world, struggles over natural resources and the like, that I can’t help but think that when things change, as things change, that there will be some improvements there, because it’s bringing us back to some of the fundamental realities, like the fact that we have limited resources. Therefore, we have to learn to care for what we do have around us. I guess, I’m so biased that I can’t see. Samuel Mann: As a species, you’d like to think we’re not stupid. How come we’ve been distracted by this party going on? Juliet Arnott: I just think it’s so convenient. There’s an allure of the sophistication of being able to purchase what you want, being able to have what you want, being able to wear what you want, when you want, eat whatever food you like, wherever in the world it’s come from, whenever you like, whatever season it is. All of that stuff. But, actually, we’ve splurged on that now. People know that they can … Not everyone of course, but people understand those realities now. The impact is such that it doesn’t really make a difference. It doesn’t really mean that we have everything we need, because in fact it’s distracted us probably from what we really need. Samuel Mann: Okay, some questions to end with. I don’t think we’ve covered this one already, so let’s do it now. What’s your go-to definition of sustainability? Juliet Arnott: You see, I stay well away from the word. Just simply because, I think it is a word that for me, has been overused in some regards. I find it easier to talK about some of the more specific concepts that make up a part of that, like resourcefulness. Samuel Mann: Okay. What’s the biggest success you’ve had in the last couple of years? Juliet Arnott: Success. That’s hard. I think probably the most meaningful thing that’s happened in terms of my work, was recently when supporting some of the planning that’s happening up in Kaikoura, post-quake. I was sitting in a room with a lot of others who had been heavily involved in the demolition process of the red zone, here in Christchurch, residential red zone, was to hear the will for change, so that community can be more involved in deconstruction outcomes, following these kinds of disasters. That for me, was incredibly heartening. It felt like a definite sense that we have learnt something from what happened here. Samuel Mann: We’re writing a book of these interviews. We’re calling it ‘Tomorrow’s Heroes.’ Looking back at the people who are doing the work. How would you like to describe your superpower? Juliet Arnott: My superpower. I think probably, it’s something to do with being … My superpower, that’s really …. Something to do with maybe being able to see the inherent value of material resources and being able to transform them. Samuel Mann: Do you consider yourself to be an activist? Samuel Mann: That sounds reluctant though. A reluctant action, or a reluctant label? Juliet Arnott: A reluctant label. The action isn’t reluctant, it’s something I can’t help. I probably don’t call myself that, no. Samuel Mann: What motivates you? What gets you out of bed in the morning? Juliet Arnott: Just, what’s yet to be done. I guess the opportunities that are there, and the impact that I see that that could have for people who would benefit from, like myself, who would benefit from being creative with resources that are undervalued. Samuel Mann: What are you looking forward to in the next couple of years? Juliet Arnott: I’m looking forward to doing more green wood working. We’ve just got a project that’s being launched at the moment, that’s pushing green wood working into the centre of Christchurch, we’ve set up a workshop in the middle of the city, so I’m looking forward to doing more and more of that myself, working with some beautiful old timbers from within the city. Samuel Mann: Two more. If you could wave a magic wand and have a miracle occur, tomorrow morning, what would you like? Juliet Arnott: I would just love to see … I would love to have a huge craft workshop facilities, that had all of the wonderful tools, and everyone knew about them, and people were coming and sharing their skills and I didn’t have to make it happen. Samuel Mann: Lastly, do you have any advice for our listeners? Juliet Arnott: Nothing that comes to mind. Samuel Mann: If someone gave you a big billboard that you could write on by a motorway, what would you put on it? 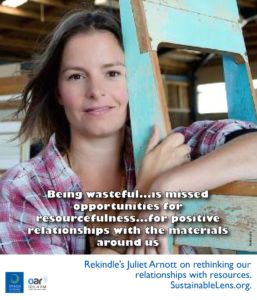 Juliet Arnott: I guess I would say something like … I guess I would ask people to consider that wastefulness is kind of like … Them being wasteful, is in effect missed opportunities for resourcefulness, you know? If you think about where those opportunities for resourcefulness lie, and seek them out, that probably will assist your will to get out of bed in the morning. Samuel Mann: Thank you very much. You’ve been listening to Sustainable Lens Resilience, on Radio. A weekly show on sustainability projects, brought to you by Otago Polytechnic. The show is co-hosted by Shane Gallagher and me, Samuel Mann. We broadcast on Otago access radio, oar.org.nz, and podcast on sustainablelens.org. On sustainablelens.org we are building up a searchable archive of conversations with people from many different fields, who are applying their skills to a sustainable future. In our conversations we are trying to find out what motivates them, and what it means to see the world through a sustainable perspective, through their sustainable lens, even if they don’t call it that. Tonight’s sustainable lens was that of Juliet Arnott, founder of Rekindle. You can follow the links on sustainablelens.org to find us on Facebook, to keep in touch, and you can listen to Sustainable Lens via Itunes as well as all the other poddy sorts of places. That was Sustainable Lens, I’m Samuel Mann, I hope you enjoyed the show. Sam’s pictures from the Whole House Reuse exhibition at Canterbury Museum.